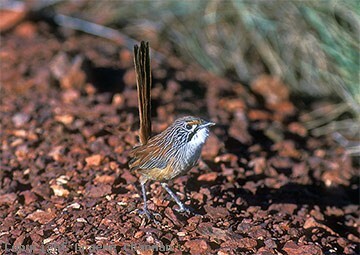 Rufous Grasswrens were listed in the 1926 RAOU Checklist as a separate species, but for much of the period since then, have been regarded as a reddish coloured variant of the Striated Grasswren. The wheel has now turned and recent studies have suggested that they once again be regarded as a full species. Restricted to the red ironstone hills of the Pilbara region of W.A., Rufous Grasswrens are known in spinifex habitat from the Barlee Range in the south, Cape Range near Exmouth and the Pilbara plateau north to Mt Herbert and east to near Nullagine and Mt Newman. They are fairly uncommon and patchy in their distribution but a fairly reliable place to look is around the outskirts of the town of Tom Price. 514201 ... Rufous Grasswren, adult, SE of Nullagine, W.A. 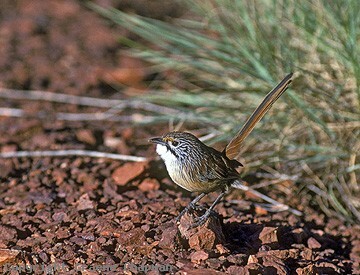 514202 ... Rufous Grasswren, adult. See also TOP SHOT LP-010. 514203 ... 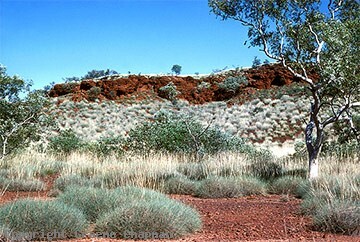 Ideal habitat south of Nullagine. 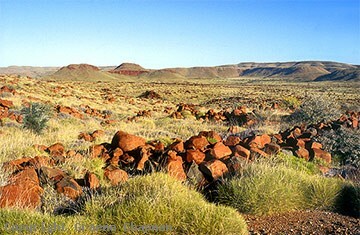 514204 ... Chichester Range National Park east of Roebourne, more good habitat.